Canada is the second largest country in the world after Russia. However, its population is only about one-fifth of Russia's. Nearly 90% of Canadians live within 200km of the border with the United States, which means that Canada contains vast expanses of wilderness to the north. The relationship to its powerful neighbour is a defining factor for Canada. The US and Canada have the world's largest trading relationship. The North American Free Trade Agreement, involving Canada, the US and Mexico, has brought a trade boom for Canada. But thorny issues abound. American moves which impact on Canadian exports, in the form of tariffs on Canadian timber and increased subsidies for US farmers, have created particular tension. Canada is also worried about pollution from US factories near the border, and about the possible impact on the environment of the exploitation of oil deposits in Alaska. Canada pursues a foreign policy that is distinct from that of the US. The country has committed troops to the American-led war on terror, but does not back the US trade embargo on Cuba. Canada did not send troops to join the US-led war in Iraq. After the 11 September 2001 attacks in the US, the challenge of securing the 9,000-km Canada-US border from possible terrorist infiltration prompted both countries to look at ways of sharing information. Immigration has helped to make Canada one of the world's richest nations. Challenges related to discrimination and integration are gaining increasing attention. Many recent newcomers hail from Asia. Canada's indigenous peoples make up less than two per cent of the population. The way in which provincial governments share land and natural resources with native groups is an ongoing issue. Separatist aspirations in the predominantly French-speaking province of Quebec are a major domestic issue. A referendum in 1995 saw advocates of an independent Quebec only narrowly defeated. Subsequent opinion polls indicated a fall in support for independence and the pro-independence Parti Quebecois was defeated in 2003's provincial election. The concept of nationhood for Quebec resurfaced in late 2006, when parliament agreed that the Quebecois should be considered a "nation" within a united Canada. The move was largely symbolic, having no constitutional or legal grounding. Canada has been asserting its sovereignty in the Arctic with growing vigour and has become embroiled in territorial spats with the US and Denmark. At stake is the possible bounty from previously-untapped reserves of oil and gas. The Conservative Party of Prime Minister Stephen Harper won a third consecutive term in office in snap elections held in May 2011. The party gained support, transforming its minorty in parliament into a majority. Mr Harper's government had been toppled by the opposition in March 2011. A motion, brought by the main opposition Liberal Party and backed by two other opposition parties, declared the government was in contempt of parliament and had lost its confidence in a row centered on Mr Harper's budget plans. The opposition said Mr Harper's government was in contempt of parliament for failing to provide the estimated costs for a number of spending programmes. It was the first time that a Canadian government had been found in contempt of parliament. Mr Harper became prime minister in 2006, after elections that brought to an end 12 years of Liberal government. However, the Conservatives failed to win an overall majority and had to work with opposition parties in order to govern. Two years into his first term, Mr Harper called an early election in an attempt to win a working majority. His party improved its position in the October 2008 election, winning 16 more seats than in the 2006 election, but still fell short of an overall majority. Two months later, Mr Harper came close to being toppled by an alliance of the opposition Liberal and New Democrat parties over his handling of the economic crisis, but avoided a no-confidence vote by suspending parliament for a month. He prorogued parliament for a second time in January 2010, this time for two months. He described the suspension as "routine", but it drew an angry response from opposition leaders. They said the move was aimed at avoiding a potentially embarrassing debate on the government's role in the torture of Afghan terror detainees. 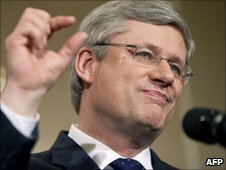 Born in Toronto, Ontario in 1959, Stephen Harper studied economics at the University of Calgary in Alberta. He became an MP in 1993 and became leader of the newly-merged Conservative party in 2004. He is married and has two children. Aside from politics and intellectual pursuits, he is passionate about ice hockey. Broadcasting in French and English, the CBC runs four radio networks featuring speech-based and cultural programmes. It operates two national TV channels, TV and radio services for indigenous peoples in the north and the international broadcaster Radio Canada International. There are just under 2,000 licensed radio stations in Canada, many of them commercial. There is extensive take-up of multichannel TV. The Canadian media are free to present a wide range of views and opinions. The broadcasting regulator rules that quotas of Canadian material - usually 30-35% - must be carried by TV and radio stations. 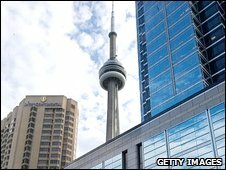 Nearly 27 million Canadians were online by March 2011 (Internetworldstats.com). Polygamy in Canada: How many wives?